that flow through the Catskills' hemlock forests. The Catskill Regional Invasive Species Partnership (a program of the Catskill Center) works to fight the hemlock wooly adelgid: an invasive insect that threatens hemlock groves. for fourth graders in the Catskills and checks stream health to boot. As a program of the Catskill Center, we’re working for the future. for public use and with conservation easements. 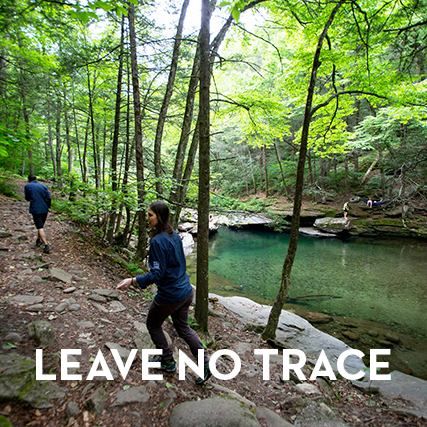 Our function as a land trust helps maintain the Catskills forest, gives wildlife a home and humans a place of refuge. For 50 years, we've spent all of our days caring for the region that we love. learn something new and grab a little wifi at the Catskills Visitor Center. Maurice D. Hinchey's fantastic notion of an Interpretive Center in the Catskills has been realized (and continues to evolve) on Route 28 in Mt. Tremper. and artists inspired by the Catskills make public their work at the Erpf Gallery and explore ideas at Platte Clove artist residencies. The Catskills is a land of makers, and the Catskill Center supports their work. at the Peekamoose Blue Hole lessened impact and enlightened visitors. 2018 was the program’s inaugural year and was such a success; we’re hoping to expand into other heavily impacted areas in the Catskills in 2019.
and flows straight from the Catskills. The Catskill Center's Streamside Acquisition Program helps keep it that way. Stabilizing stream beds helps prevent the enormous expense of filtration and keeps clean water flowing from NYC taps.